Specialist bridging lender West One Loans has today announced it has slashed rates for unregulated residential loans by up to 0.4% per month. The move, which comes after a period of sustained growth for the industry, makes West One Loans’ rates among the cheapest in the market. These will be available to all of West One’s intermediaries, not just a select few. As a result of the rate cut, loans for properties valued at under £2.5 million will have rates starting at 0.55% up to 50% LTV, and ranging to 0.85% for LTVs up to 74.5%. 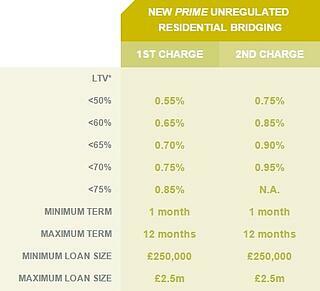 In addition West One have also made significant pricing reductions across its entire range of bridging products. The rate changes are effective immediately. Marie Grundy, Sales Director of West One Loans, commented: “At a time when there is change afoot in the bridging loan market, we see this move to reduce the rates on unregulated residential loans as an important shift to support our core customers. Property professionals have long valued our ability to get deals done when time is of the essence, and to take a commercial view when they’ve come to us with complex financing situations for their development or property portfolio work. “Now, they can get that speed and flexibility with some of the best rates in the market. That’s even more important in this period of economic volatility, where the demand for quick and flexible financing options that are also low-cost has never been greater. For many landlords looking to capitalise on the strong demand for rental property, and SME developers crying out for funding for their renovation projects, bridging finance can help them to clear the hurdle of highly competitive supply-side demand and overcome short-term cash flow issues. “We’ve supplemented that with a wider review of rates on all our bridging product lines, so brokers and borrowers know they have competitively-priced options for all their needs.